AR retentions: Contractually, the construction company and the owner define that a certain amount of the contract value is only paid after a certain timeframe (after a guarantee period). The retention amount can be calculated using SD conditions on the contract/sales order. AR retention starts from the processes in L35: Contracting. When the contract is signed with the customer, the retention payment term is maintained on the contract to reflect this payment agreement. After the billing document is released to accounting, according to the defined retention term, the actual amount and due date of Accounts receivable is calculated and reflected on the account detail information. The accounting clerk can check this information. The customer will pay the money according to retention. The accounting clerk entered the received money into the system to clear the relevant account receivable. In this activity, you check the billing document and release it. In some cases, the billing document is automatically released. If the billing document has already been released, the Release to accounting steps below (steps 11 and 12) can be skipped. The billing document was created in the L35 scenario, Contracting in section 2.6 Creating Billing Document. 2. On the Display Order: Initial screen, in the Order field, choose F4 Help. 4. Choose Start Search. The system finds the Sales order number, 1 . Double-click it to enter the value in the Order field. 5. Choose Display Document Flow. 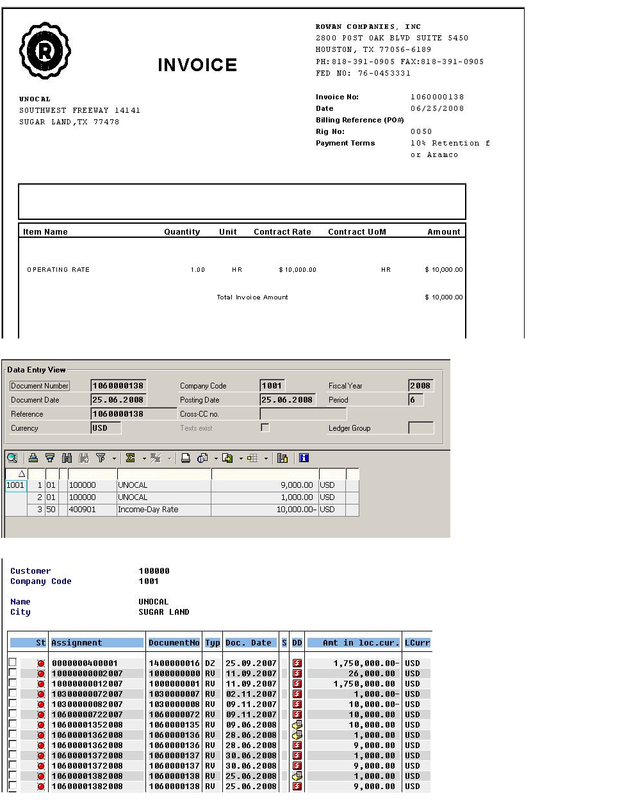 On the Document Flow screen, select the Invoice 009xxxxxxx line item and choose Display document to display the document detail. 6. On the Invoice 9xxxxxxx (F2) Display: Overview of Billing Items screen, check the total amount of billing document, and make a note of the amount ___________. 7. From the menu, choose Goto à Header à Header. 8. On the Invoice 9xxxxxxx (F2) Display: Header screen, on the Header tab, in the Price data section, ensure that the value of the payment terms is RTN1. 10. 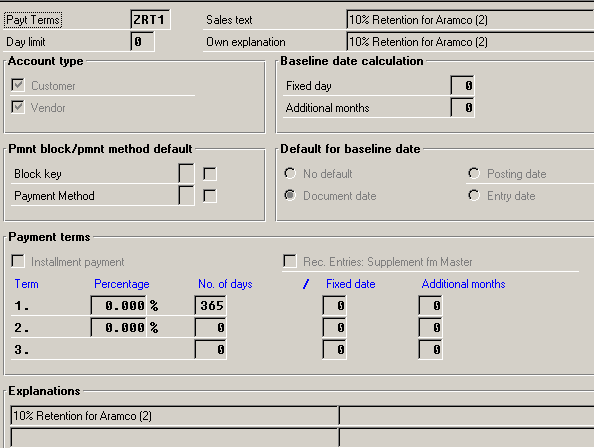 On the Invoice 9xxxxxxx (F2) Display: Overview of Billing Items screen, from the menu, choose Billing Document à Change. 11. On the Change Billing Document screen, choose Rel. to Accounting. 12. The system displays the message Document 9XXXXXXX has been saved. An Accounting document is generated from the sales order billing document. This function can be automatically achieved when you create the billing document. Depending on the configuration, normally, the project manager usually checks the billing document first and then releases it to Accounting. This activity displays the customer’s account information. 4. On the Customer Line Item Display screen, choose Change Layout. 5. From the Hidden Fields panel, choose the Net due Date and Payment term fields, then choose Show Selected Fields to transfer these fields from right panel to left panel. 7. One the Customer Line Item Display screen, find your created invoice document by looking up the document number. There are two lines with this document number. Check the amount, payment due date and payment term. One line should have a 90% amount, a due date that is the current date, and a new payment term of 0001. Another line has a 10% retention amount, a due date of current date plus 1 year, and a payment term of BLCK. 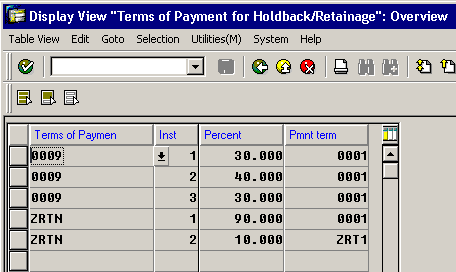 An invoice with Retention Payment Terms has been automatically split into two line items with different new payment terms. This entry was posted in 5.2 Billing documents, Tips and tagged Billing Retention on July 9, 2008 by jiteshdua. I follow your blog for quite a long time and should tell you that your articles always prove to be of a high value and quality for readers. Hi Are you looking For SAP SD Online Training Just This site . u r site is so good. thanks for u r suggestion. i read your post this post gives a very better idea on sap sd. I will recommend your site for freshers and starters, they will get a brief information on sd. I really feeling great after reading this article, I am a sap sd professional I give sap sd online training . Even I did not expect this depth. I will be regular rss reader from now. Please make updates regularly.